Are You an Industry Leader or Laggard? Similar to every other industry - the commercial laundry industry is undergoing a technology transformation. If you're not riding the technological wave you're likely falling behind your peers. As a customer, I used to worry about how I was going to get to the airport for a 6:00am flight. I would call a taxicab company the night before and arrange for a 4:00am pickup. After a sleepless night, I’d rise to find no taxi waiting for me which left me scrambling to find an alternative way to get to the airport. Then Uber offered convenience, power, and information to the consumer. With the click of a few buttons on my phone I’m able to see reviews of my driver, how long until my ride will arrive, and how much money the ride is going to cost me. The commercial laundry industry is undergoing a similar transformation. 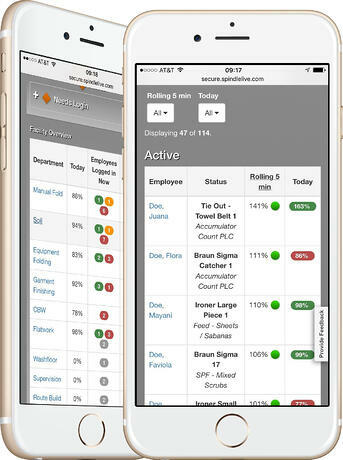 Convenience, power, and information about your plant and your team is now at your fingertips. With just a click of a few buttons on your phone, you can see the real-time throughput of your equipment and how staffing impacts the results. Disruptive technology is just that, making historical baselines and benchmarks irrelevant. A commercial laundry recently utilized Spindle to increase their pounds per operator hour (PPOH) from 85 to 130. This type of step-change improvement lowers your costs and distances you from your competition; allowing you to focus on serving your customers. As taxicab companies fight tooth and nail to protect their turf from Uber, I sleep soundly knowing that Uber will be there for me in the morning.